If you already have fairly large or full breasts but wish to re-contour their shape or reduce their size, a breast lift without implants or a breast reduction may be right for you. At RGV Cosmetic Surgery & Vein Center, dual board-certified plastic surgeon Dr. Filiberto Rodriguez and his team offer the following breast surgeries to women who live in and around Brownsville, the Rio Grande Valley, McAllen, and all of South Texas. When you have naturally large breasts, you may have to struggle through a number of uncomfortable side effects. For example, women with excessively large breasts often complain of back, neck, and shoulder pain from heavy bras. You may also notice your breasts drooping and sagging significantly as you age. A breast lift with reduction can help if you wish to achieve perkier breasts while reducing their overall contour to a more comfortable size. The before-and-after pictures below can help give you a better idea of what may be expected from the results of a breast lift without implants or a breast reduction. The images are completely unedited and feature real patients, just like you! This 46 year-old woman from the Edinburg, Texas area presented to my cosmetic surgery clinic for a breast reduction and lift. She is 5’2” tall and weighed 159 pounds. We discussed the breast reduction procedure using a superior-medial pedicle technique with an extended vertical (LeJour) mastopexy (breast lift). This would result in nice perky breasts rather than a boxy looking breast and without the long anchor scar of the traditional Wise Pattern technique. As part of her procedure we performed additional VASER liposuction to her anterior axilla to enhance her breast contour. We excised 300g of breast tissue from each side. Her results are shown only 3 months after her surgery. She loves her results! This 26 year-old woman from the McAllen, Texas area presented to my cosmetic plastic surgery clinic requesting a breast lift. She is 5’2” tall and weighed 180 pounds. She had heavy, pendulous breasts with Grade 3 ptosis (drooping). As part of her procedure, the patient also desired a cosmetic breast reduction. We performed an Extended Vertical LeJour Lift (vertical mastopexy) with a cosmetic breast reduction. Her results are shown only 2 months post-op. She was a 36DDD and is now a 36D. She loves her smaller, perkier breasts, and she states that people ask if she had breast implants placed! This 38 year-old woman from the Corpus Christi, Texas area presented to my plastic surgery clinic requesting a Mommy Makeover. She is 5’5” tall and weighed 183 pounds. She had lost a significant amount of weight over the past two years with a low-carb diet and exercise. An important concern was her sagging breasts, and she desired perkier, lifted breasts without implants. She had enough tissue and was an excellent candidate for an extended vertical LeJour mastopexy (breast lift) without implants. In addition, we performed VASER liposuction to front part of her under arm region and the side of her chest to enhance the breast lift result with additional skin tightening to these areas. Her results are shown at 4 months, and she loves her cosmetic surgery results. This 34 year-old woman from the McAllen, Texas area presented to my plastic surgery clinic requesting a breast lift. She is 5’2” tall and weighed 138 pounds. She is a very active woman, and she desired a more lifted, and perkier breasts. She did not want breast implants. The patient had Grade III breast ptosis (drooping) with ample breast tissue. I performed an extended LeJour breast lift (vertical mastopexy). She was a 34DD before and she is now a 34D after. Her results are shown at 3 months. She is very happy and loves her cosmetic surgery results! 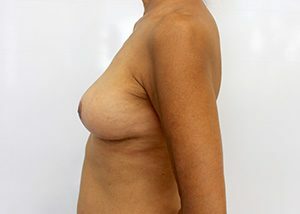 This 61 year-old woman from the McAllen, Texas area presented to my plastic surgery clinic requesting a breast lift with liposuction and skin tightening of her anterior axilla. She is 5’1” tall and weighed 109 pounds. She was an excellent candidate for a vertical LeJour mastopexy (breast lift) without implants, and we performed a small breast reduction on the larger left breast to enhance the symmetry of her breasts. In addition, we performed VASER liposuction to front part of her under arm region and the sides of her chest to enhance the breast lift result with additional skin tightening to these areas. Her results are shown at 2 months, and she loves her cosmetic surgery results. This 58 year-old woman from the Brownsville, Texas area presented to my plastic surgery clinic requesting a breast lift. She is 5’2″ tall and weighed 140 pounds. She is a very active woman, and she desired a more lifted, and perkier bustline. She also desired enhanced upper breast fullness, but wanted to avoid implants. The patient had Grade III breast ptosis (drooping) with ample breast tissue. I performed an extended LeJour breast lift (vertical mastopexy) with a superior pole auto-augmentation technique. She was a 34C before and she remains a 34C after. She states that she now fits better into her bras and loves her enhanced cleavage. Her results are shown at 3 months post-op and she is thrilled with her cosmetic surgery results. This 63 year-old woman from the Brownsville, Texas area presented to my plastic surgery clinic requesting a breast lift. She is 5’8″ tall and weighed 169 pounds. She is a very active woman, and she desired a more lifted, and perkier bustline. She also desired enhanced upper breast fullness, but wanted to avoid implants. The patient had Grade III breast ptosis (drooping) with ample breast tissue. I performed an extended LeJour breast lift (vertical mastopexy) with a superior pole auto-augmentation technique. She was a 36DD before and is now a 36D. Her results are shown at only 2 months post-op and she loves her new look after her cosmetic surgery. This 47-year-old woman from the Harlingen, Texas area presented to my cosmetic surgery clinic for a Mommy Makeover surgery. For her breast enhancement, she needed a breast lift, and she did not want breast implants. She is 5’2” tall and weighed 183 pounds. We discussed the breast reduction procedure using a superior-medial pedicle technique with an extended vertical (LeJour) mastopexy (breast lift). As part of her procedure we performed additional VASER liposuction to her anterior axilla to enhance her breast contour. We excised 330g of breast tissue from her right breast and 320g from her left breast. Her results are shown only 6 weeks after her surgery. She loves her results! This 46 year-old woman from the Brownsville, Texas area presented to my plastic surgery clinic requesting breast lift surgery (mastopexy). She wanted to avoid implants. She is 5’6″” and weighed 143 pounds. She was a 36C and had adequate breast tissue to performed a minimal scar LeJour Breast Lift without implants. She is now a 36B and is very pleased with her cosmetic surgery results. This 42 year-old woman from the Brownsville, Texas area presented to my plastic surgery clinic requesting breast enhancement. She wanted to avoid implants. We performed a minimal scar LeJour Breast Lift without implants, and she is very pleased with her new look after her cosmetic surgery. This 66 year-old woman from the Brownsville, Texas area presented to my plastic surgery clinic. She is 5’10” tall, weighed 164 pounds, and was a 32G. She desired a breast reduction, but wanted to still be a “D” cup. We performed a breast reduction as part of an extended LeJour breast lift without implants. We also performed a Tummy Tuck for her at the same time, and she states that she “can’t believe she’s wearing bikinis again!” Her results are shown at 3 months post-op and she is thrilled with her cosmetic surgery results. If you reside in McAllen, the Rio Grande Valley, Brownsville, or anywhere within South Texas, and you are considering a breast lift procedure without implants/reduction, you can contact RGV Cosmetic Surgery & Vein Center to schedule your personalized consultation with one of our board-certified plastic surgeons today!